Believed to have once been a net loft, Mariner’s Belle is a ground floor apartment situated in the heart of Downalong, St Ives. The apartment is ideal for families with it’s large open plan living area and three bedrooms. Mariner’s Belle is situated perfectly for the beaches of Porthmeor and Porthgwidden, The Tate and Harbour. There are no rooms available at Mariner's Belle for these dates. Believed to have once been a net loft, Mariner’s Belle is a ground floor apartment situated in the heart of Downalong, St Ives. 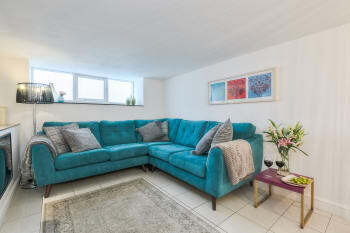 Benefiting from an off site parking space, this is the perfect location to explore the beaches of Porthmeor and Porthgwidden and the surrounding areas. The apartment is ideal for families with it’s large open plan living area and three bedrooms.